“When did you know you were lost?” he asked, once we’d made it some miles inland. The artillery had faded now, a distant thrumming like timpani in a stygian orchestra, accompanied by Mausers and Brownings for snares. I shook my head and felt the blood come loose from my ear. “Have a seat, son,” the colonel said, bracing me at the shoulders and guiding me onto a crate. He produced a handkerchief and wiped the blood from my neck, turned my head from side to side and tracked the jagged movement of my eyes. My bearings, I thought, wildly. Longitude and latitude. If I’d had a map, how would I plot my coordinates? In two dimensions: Somewhere near Saint-Aubin-sur-Mer, Normandy, France. In three: The surface of the planet Earth, some 93 million miles from the closest star and 25,000 light years from the galactic center. And in four? One infinitesimal sliver of time in the short history of life on Earth, that span itself flanked by 13.8 billion years to one side and an unknowable expanse of emptiness to the other. The colonel made a face. The colonel sat back on his heels and nodded. I looked around. We were in an old barn, somewhat slumped with age, here and there admitting pillars of slanted light through gaps in the slatting. The light was rusted. The sun was nearly down. He unfolded a map traced with contours of the French terrain and started marking it with a grease pencil. I shut my mouth and let him work, though just then my chest started to burn queer-like at the middle. Like an ant had burrowed through my back… then two, then five… until the whole nest was crawling around in the shelter of my ribs and turning my heart to jelly. In the fifth grade, my best friend had been a girl named Lizzy. She’d had freckles over the bridge of her nose and eyes the color of the sky at first light. She would hold my hand as we walked back from school. Mix her days with mine in the heat of summer, fumbling through woods at dusk. Cry when I fell down. Kiss me and cry all at the same time. For my birthday that year, she asked her mom how to make peach cobbler, then made it herself, and walked it the mile and a half to my house. We’d eaten it greedily on my front porch as the frogs sang and the stars came out. I could feel it in my belly now, warm and oozing—hurting. Now it ran down my leg in gobs and I began to cry. “Jesus Christ, kid!” the colonel shouted, and he shot to his feet. But then he looked at me and he got real quiet. I swayed on the crate and felt a pressure in my hand, a warm pressure, small and steady. I felt a soft heat on my cheek and tasted salt and wet. Heard a whimper. The lines slid off the colonel’s map, the spokes of rusted light wheeled. Sunset became nighttime, and nighttime faintly glowed. Another week, another Speakeasy challenge! I played it pretty loose with the photo inspiration this time (said photo appearing at the top of this page), but I took France and the beach from it, so that’s enough, right? I felt I got a little too saccharine with this one at the end, so I’m curious to hear your own thoughts on my story in the comments below. Let me know what worked and what didn’t! 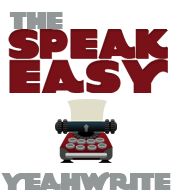 When you’re all done with that, click the link, head on over to the Speakeasy, and read the other entries for the week. There’s always a little something for everyone! Wow. Your use of imagery is spot-0n. Another one of those unforgettable stories. Nicely done! These flashbacks are beautifully written, and I love the contrast with the colonel’s matter-of-factness. Death from the first person is tricky…I think you do a great job of describing the physical sensations. Thanks Jennifer, I’ve attempted the whole first-person death scene a few times before and you’re right it is a bit tricky to hit the right balance of feeling and confusion and realism. I’m glad you thought I did a decent job of it! Nice read and, I like the ending just fine. Great stuff, Brian. Personally, I think I prefer the gritty first half to the airy fairy ending, but because it’s a death told from the first person, I’m inclined to say it works as it stands. I just read someone die. No you did not get too saccharine toward the end… that made the story. Thanks Ted! You’ve been reading my stuff since way back, so I take your comments to heart – much appreciated! Not saccharine at all! Very subtle, actually. The writing is exquisite. Can’t praise this enough. I agree; not too saccharine. The colonel balanced it out, too. But no, it just seemed like he was philosophizing as the life ebbed out of him, and going through what for him were the important parts of his life. I loved “the light was rusted.” Great description! I agree with Meg and Silverleaf – not too saccharine, nicely balanced very well written. And I am in awe of how adept you are with imagery. What killed him? Sounds like he had moving shrapnel in him! Awesome writing. Love your style! You get me every time, Brian. Brilliant story. Oh wow, Brian. This is so good – you always bring such craft to your writing. Not saccharine at all, but deeply moving and beautifully balanced. This is a splendid story, written so matter of fact and well balanced emotions. Very good indeed! Nope, I didn’t think the ending at all saccharine. The narrator became emotional and slightly rambling at the end but it was entirely fitting and in context – his guts are seeping onto the floor and who knows what moments from your past might come back to you then? I think your fine eye for descriptive detail keeps the writing grounded in reality, e.g. “His ears looked like two deflated rubber boats”, which I love btw. I don’t think the ending was “saccharine.” No, to read the thoughts and images from a dying brain, it’s terrifying, so having the sweet memory of that past friendship surface at the end was…a little bit comforting somehow. I like this. I really liked the pulling away in scope of the Longitude and Latitude paragraph. That line about ‘only me to cry when I fall’ read as melodramatic to me, but I think that is allowed when someone is dying. Self pity is an appropriate emotion when one is a victim of war. Your metaphors are spot on as usual, Brian. I enjoy reading your stuff! I didn’t think it was saccharine. Poignant, maybe. I like how the past seeps into the present as the narrator’s thoughts wind down to the end. Such powerful writing. This touched me on an emotional level. His connection between his experiences with Lizzy that led him to the present situation, is beautiful and heart-wrenching all at the same time. The simile of the ants moving in his chest was spot on, unique, and fascinating. This is easily the most moving story I’ve read in the group, and I’ve read some expertly written stories. This is so heartbreaking. Your descriptions are so good- like the face ragged as the cliffs of Dover, and the barn slumped with age.